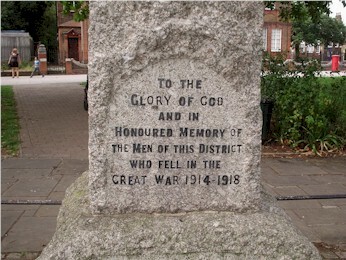 The war memorial on the West Green, which stands at the junction of West Green Road and Philip Lane, has been there for over 90 years and pays homage to the young men of this particular corner of Tottenham who gave their lives in the Great War 1914-18. 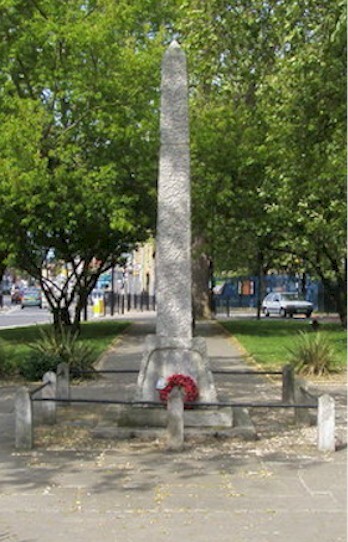 Sadly over recent years the memorial appears to have been forgotten by the burghers of Tottenham and has fallen into a state of disrepair. At one time there were regular ceremonies on Remembrance Day but these have not taken place for several years and now there are rarely any poppies laid upon the memorial. We therefore decided to conduct a little research on the origins of the memorial and hopefully to raise more awareness of its significance to the area and campaign for its restoration. 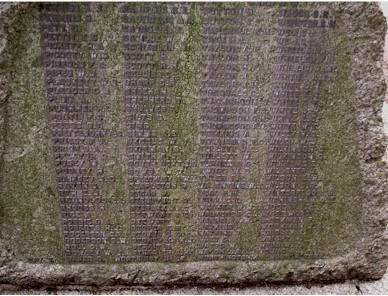 Pictured below are just a few sections of the memorial that show some of the victims names. There are over 420 names on the memorial so we decided to select just a few names at random to research and to provide an insight to the backgrounds of these young man and where they and their extended familys once resided in Tottenham. By coincidence one of the first names we selected was that of OSWALD-HICKS H.L.A purely because it was an unusual name and would hopefully be easy to research. 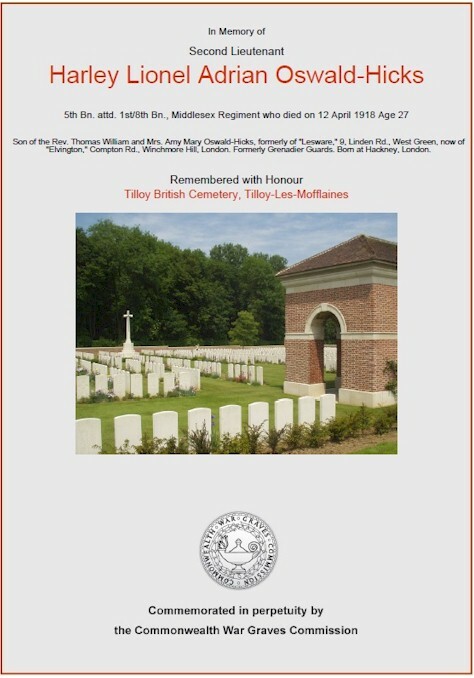 We first discovered that his full name was Harley Lionel Adrian OswaldHicks and he was the son of the Revd Thomas Oswald Hicks of Linden Road, West Green. 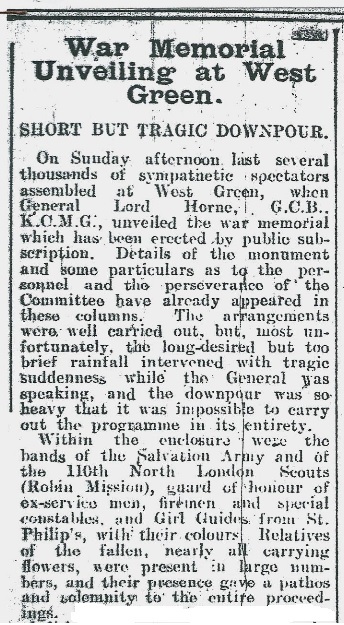 However our subsequent enquiries disclosed that it was his father who had launched the campaign to construct a lasting memorial to the sons of West Green which was eventually dedicated on Sunday 16TH July 1922. It was also poignant to discover that much of the monies that were collected towards the cost of the memorial were donated by the local residents of West Green. The amounts were often quite small but, at a time when the population were recovering from the aftermath of the war and suffering both emotional and financial hardships of their own, it was very moving to see how the residents rallied around to remember their loved ones who gave the ultimate sacrifice to King and Country. 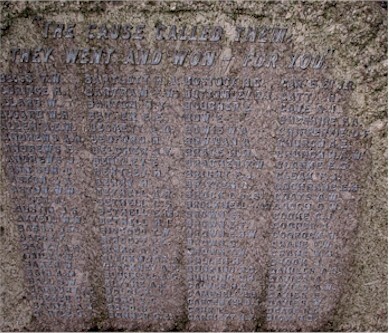 There follows just a few examples of our research on the local men of West Green whose names appear on the memorial. It was noticeable that the majority of these men had once lived within a radius of One Mile from the location of the memorial which is a testament to the large loss of lives suffered in the community. We acknowledge the individual memorial citations that have been obtained from the Commonwealth War Graves Commission (C.W.G.C). We also referred back to the 1911 Census to discover the family backgrounds of the deceased which was after all just 3 short years prior to the commencement of WW1. Harley was the son of the Revd T.W Oswald-Hicks and Mrs M.A Oswald-Hicks. He was born at St Johns, Hackney in 1891. It was the Revd Oswald-Hicks who launched the campaign for a memorial to be erected in West Green not only for his own son but also for the many other local victims of the Great War. At the 1911 Census Thomas William Oswald-Hicks was a Surveyor and Estate & Business Agent with his own business. Clearly he took up his ministry as a Vicar in the intervening period. Harley also had an elder sister Gertrude Claire Annie Oswald Hicks who in 1911 worked for her Father in his Estate Agents business. We have used a combination of records to cross reference our information. 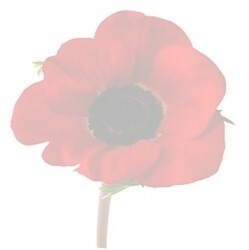 These include CWGC  Ancestry.co.uk  FindMyPast.co.uk and the 1911 census records. Very often this has proved useful to establish a Tottenham connection for each individual. We are informed by the CWGC that many WW1 records were destroyed by a fire during the Blitz in WW2 that has obviously curtailed our research and prevented access to all casualty records. Many CWGC records only provide name number and regiment and where commemorated. Very often no ages or where they lived is provided. Cross-Checking FindMyPast and Ancestry records will sometime show where the person enlisted and the 1911 Census records can provide date and place of birth and you can then be confident it is the same person and indeed that they have a Tottenham address. We suspect that many people had moved to Tottenham since the 1911 Census either because they had changed jobs, married or were living with relatives in the area. In some instances we have found Electoral Roll entries for 1914 that has helped identify them. Over 20 of the men had lived in nearby Langham Road, West Green. Many men had died on the same day. 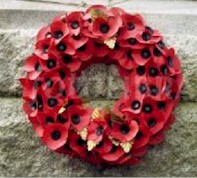 For example 8 men on the 1st July 1916, which was considered to be the first day of the Battle of the Somme. There are many examples of brothers from the same families who died: BETHELL  HENLEY- BOWIE- BOND - CRANE to name just a few. Over 45 men from West Green are commemorated on the Thiepval Memorial in France. Many more are commemorated at Ypres (Menin Gate) memorial. Local men who served in the Navy are commemorated at Portsmouth, Plymouth and Chatham Naval Memorials. We have retained copies of the Commonwealth War Graves Commission (CWGC) citations for the men who we have researched along with Census reports and other data that has been pertinent to our research. Copies of these records are obtainable on request. We have researched randomly the profiles of a further 26 men whose names appear on the memorial and hopefully this should provide a background of their social and family history: CLICK HERE to view the complete list. As already explained, this brief social history of just a few of the victims selected randomly from the many names on the memorial, merely scratches the surface of the suffering and hardships experienced by these families of West Green. My brother, Ray Swain has recently written to the West Green Residents Association to seek their support for the restoration and future upkeep of the memorial. In his letter he makes the following request which hopefully captures the feelings of many of todays residents of the area. There has also been a similar appeal by the Friends of Downhills Park who are also concerned about the forgotten memorial in West Green. Article prepared by Alan Swain.